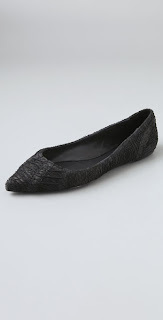 I'm on a quest to help every working girl find stylish shoes to maximize fashion & practicality. This is an easy reference site to help find fashionable shoes that are still professional, comfortable & practical. While I love my Manolos, most of us can only splurge once in a while so I also promote affordability. With guest judge, January Jones bringing the superb styling eye of Mad Men, the runway was no place for amateurs. Leaving the Forever21 meets Candyland far behind, Mr. Mondo for gave us a fresh and very Mondo-ern (Mondo Modern) Jackie O. look that won the judges, and me, over. So major snaps to Mondo, especially since he made me melt last week when his heart grew three sizes a la Grinch Who Stole Christmas style when he hugged Michael C. and apologized. (File that under: FAVORITE PR moment!) (so far ;) ) You can check out his fab design here: Project Runway Season 8. Sadness struck when we had to part ways with sweetie pie Michael D. as he was auf’ed for his “schizophrenic” look. And while he was the one chopped, few were spared from the slicing remarks that whipped the designers like the insane tornado storm that hit New York City last night. Ouch! Of all the carnage, I mean critiques, I have to agree with Ms. Jones commentary about Valerie’s bootie pick for her outfit. It did not help her cause. She should have tweeted me for some other options. ;) Hey Val, I’m here for you, anytime you need me Huney! I’m dying to see what the big drama is with Valerie in next week’s episode. I fear she may leave the show. :( But really, I’m hoping that Tim discovers Mondo and Michael C.’s love child. ;) Seriously, imagine how fashionable that kid would be! Have a shoe-per weekend Dolls! I love all things fashion and think that you don’t have to sacrifice style for being environmentally conscious. The sidewalk is my runway and I love marrying fashion and style with urban living. Subscribe Me to the Posts! What Would Project Runway Shoe? Episode 11: Poison Ivy, Working Up a Sweat! Are You Ready For This Jelly? What You Need In Your Shoe Closet. Having a Shoe Dilemma, or worse, a Shoe Emergency? In the store and can't decide whether the shoe you're trying on works? Have a shoe you love but it pinches your toes or your heels slides out? Feel free to post, email, tweet or Facebook me your questions and emergencies. I'm happy to help! :) Business inquiries also welcomed.